The other day I wanted to crochet but I also needed to make some earrings. 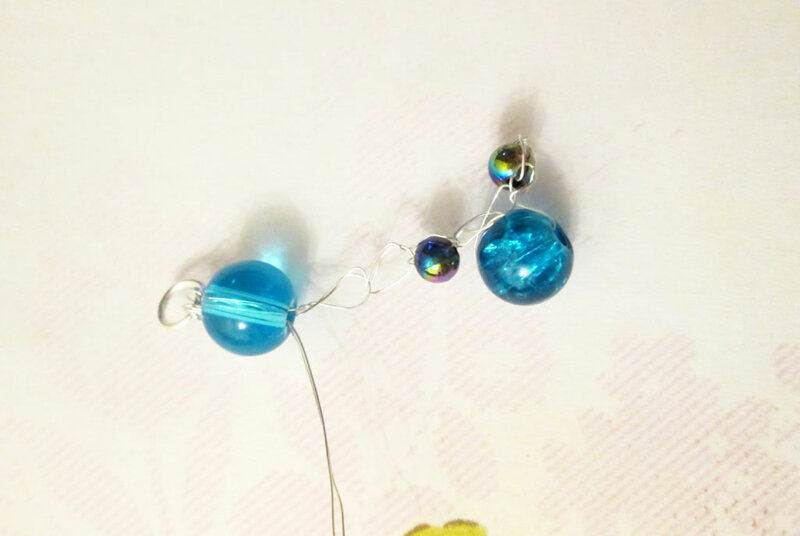 So it got me thinking: would it be possible to mash the two things together and crochet some earrings? Preferably earrings that are neither enormous or woolly looking. I had a go at crocheting some fine wire and the results were not enormous or woolly! They were rather fiddly but they are very delicate light to wear, so well worth it! 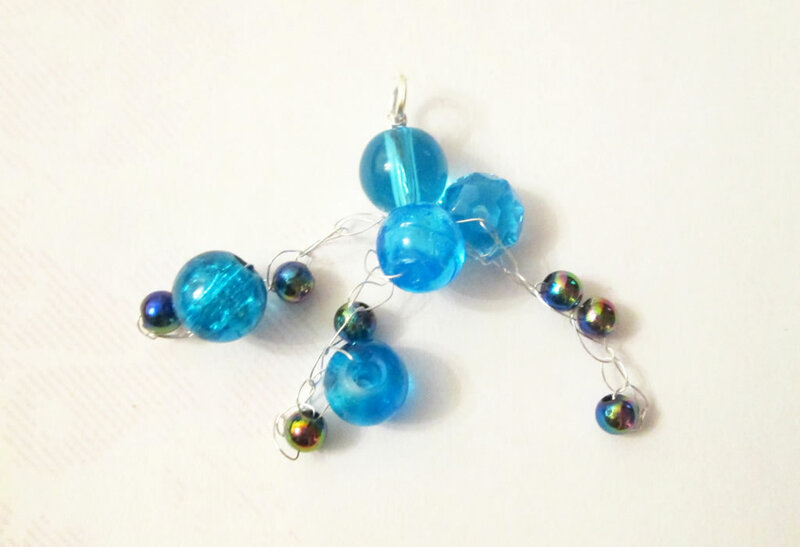 They are made by crocheting three strands of wire, adding beads as you go, then plaiting the strands together. I have included Amazon affiliate links for the materials. 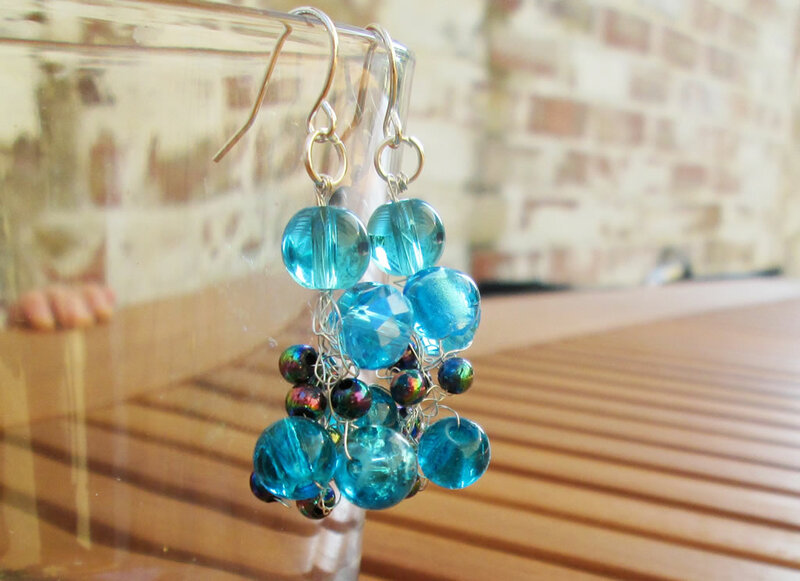 If you would prefer to buy a kit for making these earrings, complete with instructions, you can do so here. 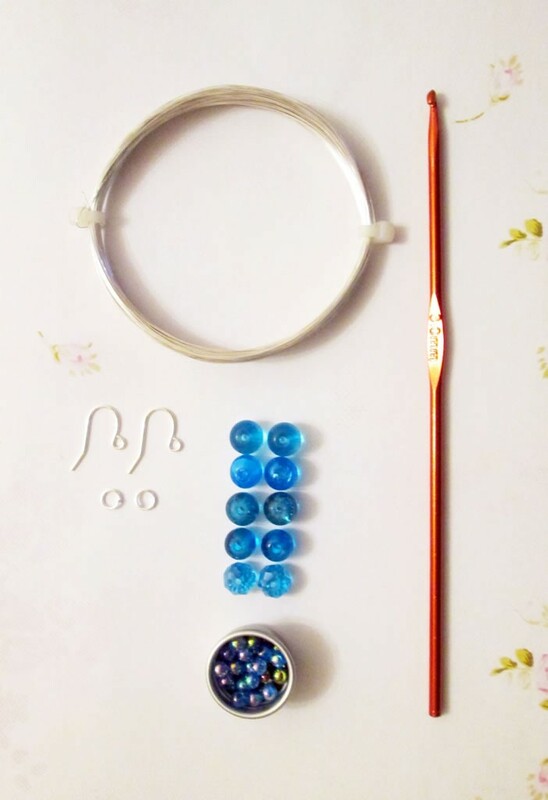 You will need: fine craft wire (1 metre will be enough to make 1 pair of earrings), a 2 or 2.5 mm crochet hook , 2 earring wires , 2 jump rings , wire cutters or pliers (or scissors will do but not your best pair! 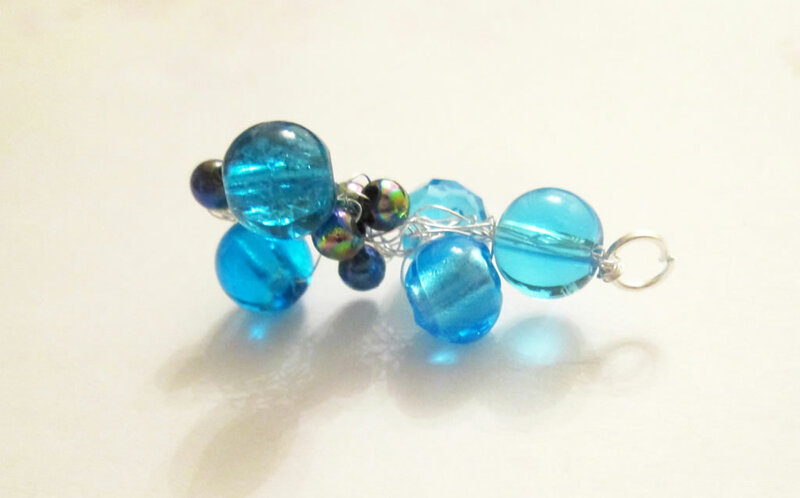 ), 10 beads including a mixture of 6mm glass beads , 8mm glass beads, crackle glass beads and faceted beads , and a selection seed or other small beads . 1. 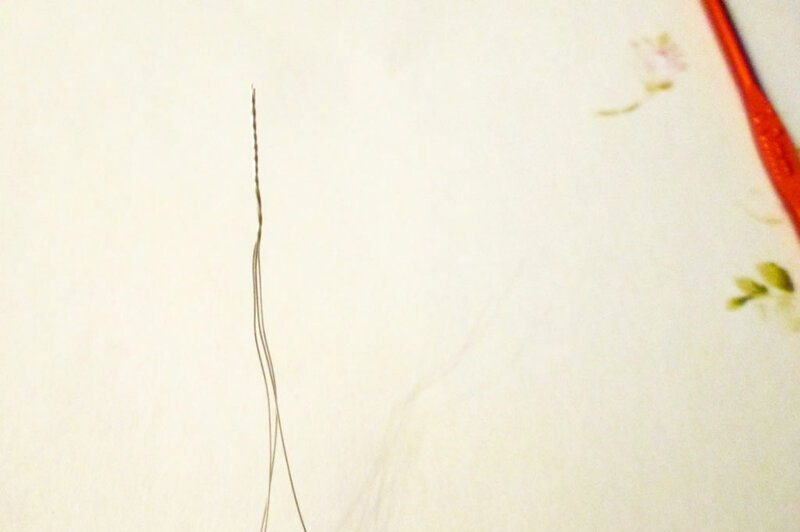 Cut 3 pieces of wire, each measuring 15cm. Twist the ends together a couple of times. 2. 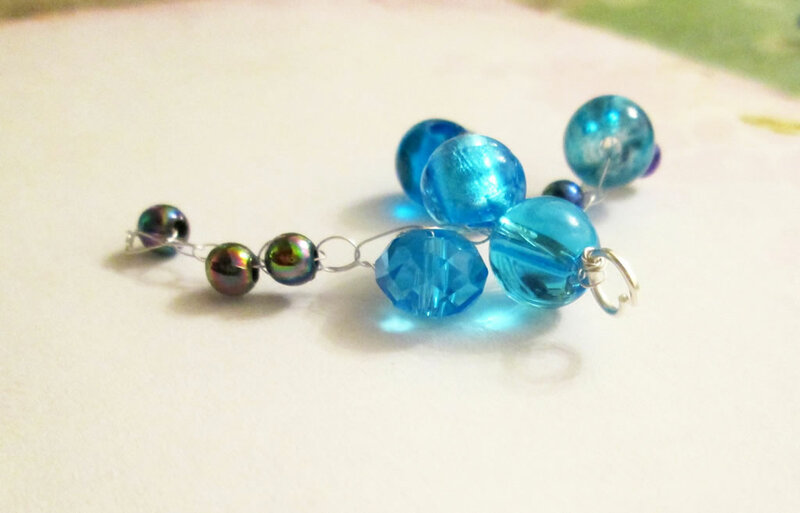 Slip one of the larger beads onto the twisted end. Thread the same end through a jump ring and twist to secure. 3. 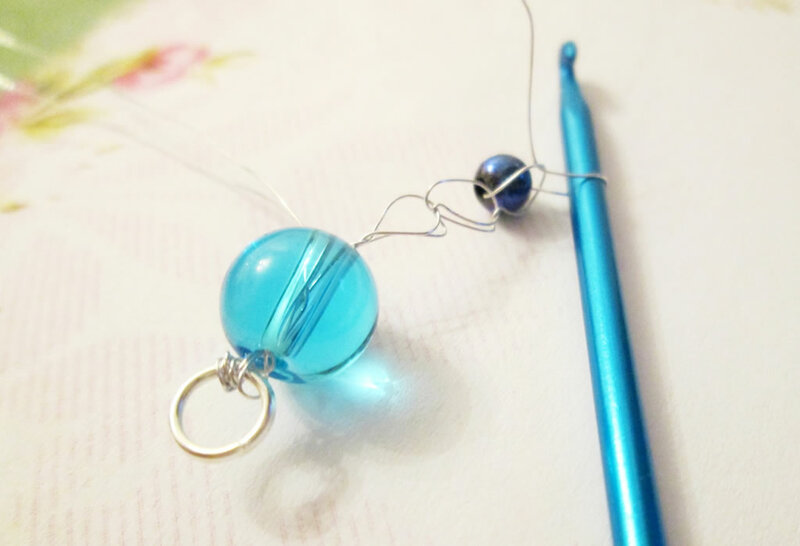 Using the handle end of the crochet hook, make a loop next to the bead in one of the strands of wire and twist it a couple of times. 4. Now we’re ready to start crocheting! A word of warning first though: crocheting wire is not like crocheting wool. It sounds obvious but the lack of stretchiness took me by surprise. Crochet a couple of chains. 5. 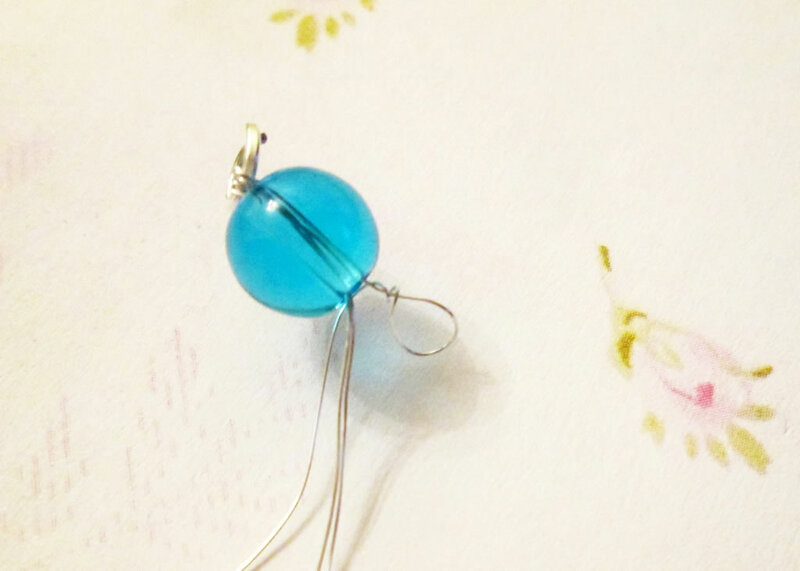 Slip a bead onto the wire. Then crochet one chain by taking the wire from the far side of the bead. 6. Continue to crochet chains and add beads. Try to space the beads out so that when you plait the strands together at the end, the beads are evenly spaced out. 7. Repeat for the other two strands. 8. Gently plait the three strands together. 9. Using the jump ring, attach the earring wire. Repeat for the other earring. 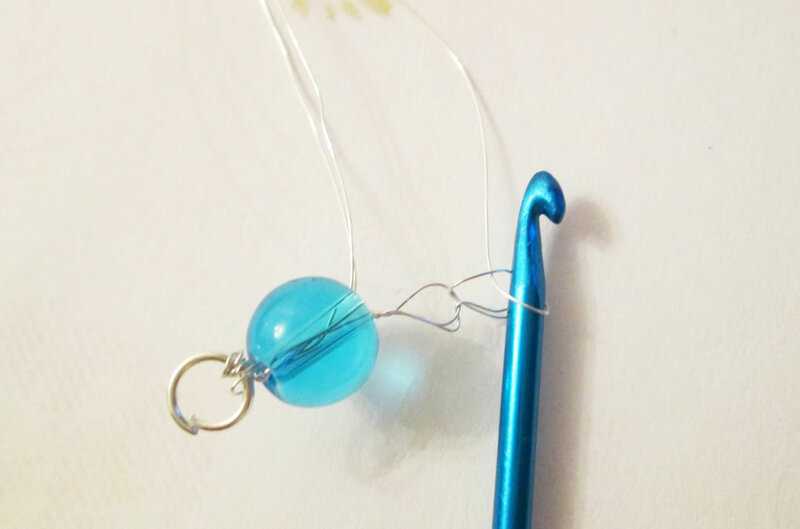 Use a metal crochet hook because the wire will probably gouge lumps out of a bamboo one! As wire does not stretch, the loops in the chain need to be big enough. If they are not, wiggle the loop down the crochet hook to where it is wider then back up again. If overworked, the wire will break, so be careful when twisting. 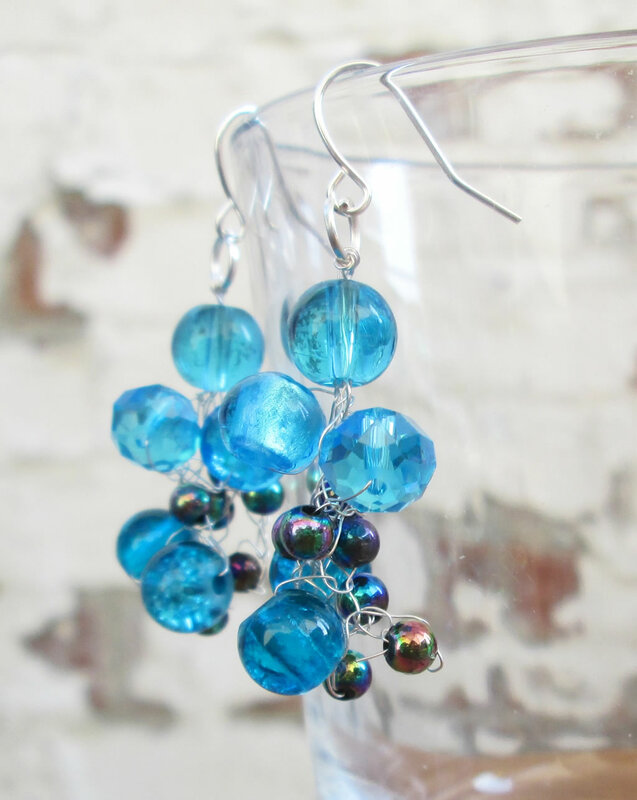 If it does break, you may be able to reattach beads using extra bits of wire. If the strands are difficult to plait, try pulling them gently to stretch the chains a little bit. 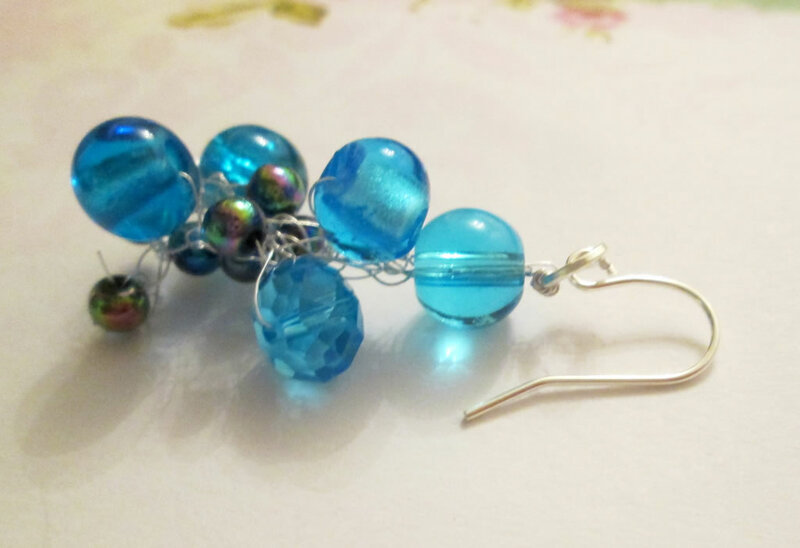 If you would like to buy a kit to make the earrings and not have to faff about buying lots of different beads when you only need a few, you can do so here. 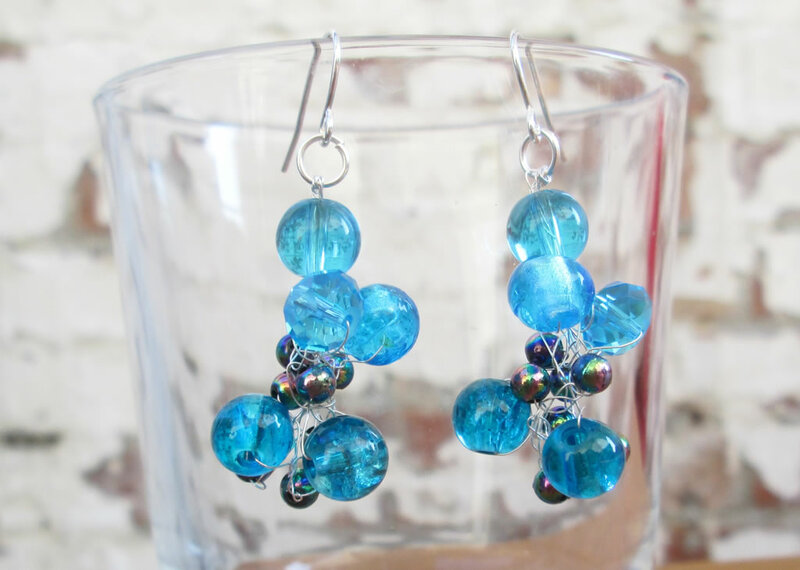 these crocheted earrings are so pretty, so delicate and love the sparkle! I will have to try this but I am so heavy handed, I hope they turn out! thanks for sharing the how to! I’d love to see how they turn out! 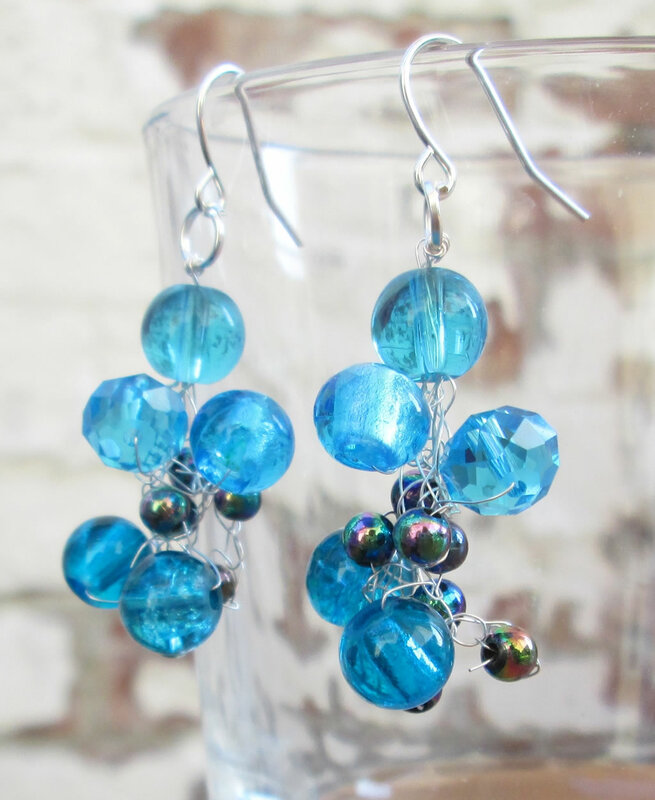 These are fabulous, and so happy to “meet” you on craft schooling Sunday! It looks like you’ve earned yourself a feature, and i hope you’ll be back again to share more great projects. 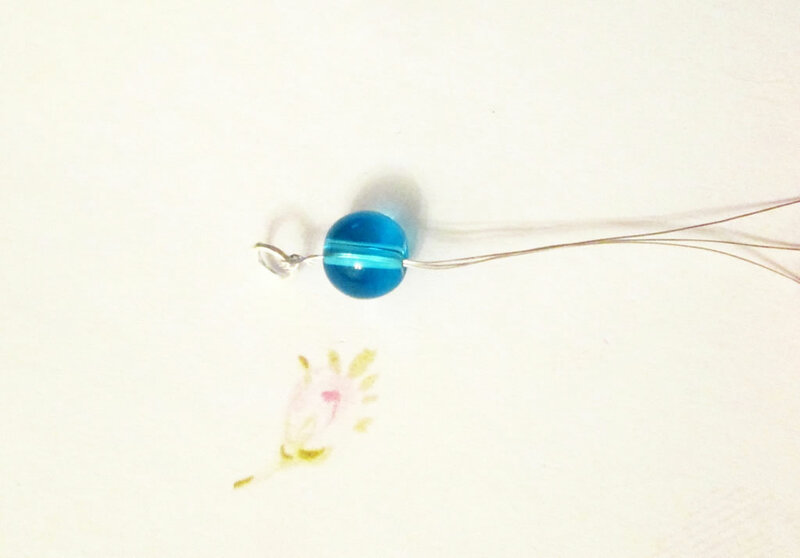 I would not have thought of crocheting metal wire, but then I’m new to crocheting. They certainly don’t look woolly or bulky. Perfect. I don’t know why I thought of crocheting wire. Maybe I’ll just crochet anything I can get my hands on! What a beautiful pair of earrings, you have so many good ideas. Thank you! I was very happy with how they turned out.